JENSEN-GROUP takes sustainability and environmental protection seriously and is pursuing a continuous energy strategy in order to rise to the challenges of the future, such as climate change and the finiteness of fossil fuels. The objective of the JENSEN CleanTech concept is to increase the efficiency of primary energy and to ensure it is consumed more economically with gas-heated laundry equipment. 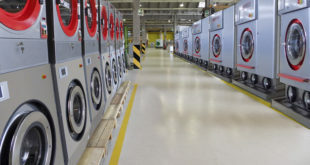 In its development of laundry machines, the JENSEN GROUP focuses on high performance with as little energy and fresh water input as possible. 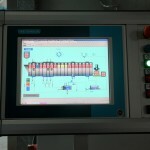 As well as the use of direct gas operation, this involves integrating water- and energy recovery systems into machines. However, the JENSEN-GROUP does not just confine itself to reducing CO2 emissions and energy and water consumption in its machines. The JENSEN-GROUP also handles valuable resources and energy sources carefully in production. 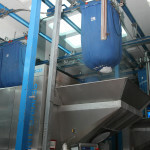 Why change from a steam-operated laundry to JENSEN CleanTech? 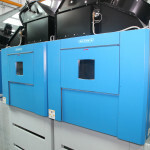 JENSEN CleanTech consists of components with directly gas-heated equipment, which together form a complete laundry concept. The steam boiler and all associated equipment for water treatment and steam supply are no longer necessary. The steam-free continuous batch washer is equipped with the gas-operated Aquaheater, which heats up the process water in the compartments where steam used to be injected. 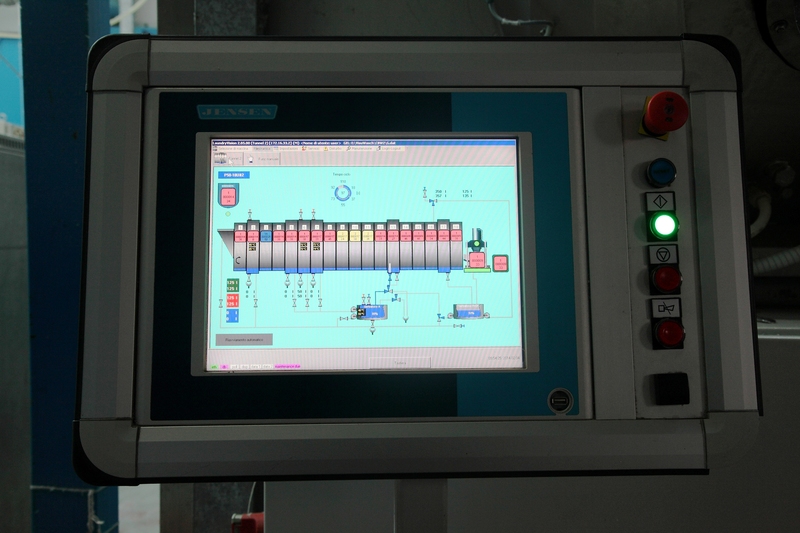 This way, the same amount of energy is supplied to heat the process water up to the required temperature. The integrated modular tube-in-tube heat exchanger Spiraliser reduces the energy consumption of the continuous batch washer by about 30%. Depending on the process temperature, up to 0.15 kWh/kg energy can be saved with the tube-in-tube heat exchanger. Detergent suppliers recommend operating the continuous batch washer at lower temperatures. Experts claim that by washing at approximately 60°C to 65°C using the special low-temperature process, the energy consumption can be reduced by 0.1 kWh/kg compared with conventional wash programs that operate at 85°C. Maximum energy savings can therefore be gained by combining a low-temperature process with the integrated tube-in-tube heat exchanger in the Senking Universal Gas. We recommend calculating the total operating cost savings on a case-by-case basis, due to the number of different factors that influence the process. The gas-operated Senking dryer can achieve the most efficient performance with Infrared Control and the RecoCross heat exchanger. 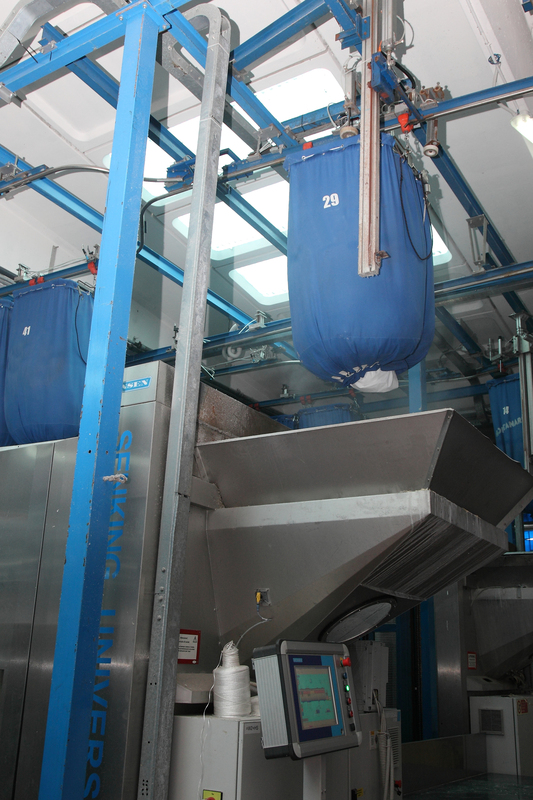 These two options enable energy consumption during the drying process to be reduced by up to 35%, i.e. 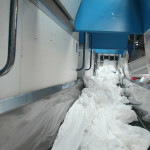 up to 0.2 kWh/kg during the full drying process with towels, for example. The energy consumption of the dryer can be further reduced by about 20% when a Senking SEP 36-90 HP or SHP press is used for draining. Due to the high pressure (up to 57 bar), moisture retention of 35% can be achieved in comparison to 45% with a standard press. 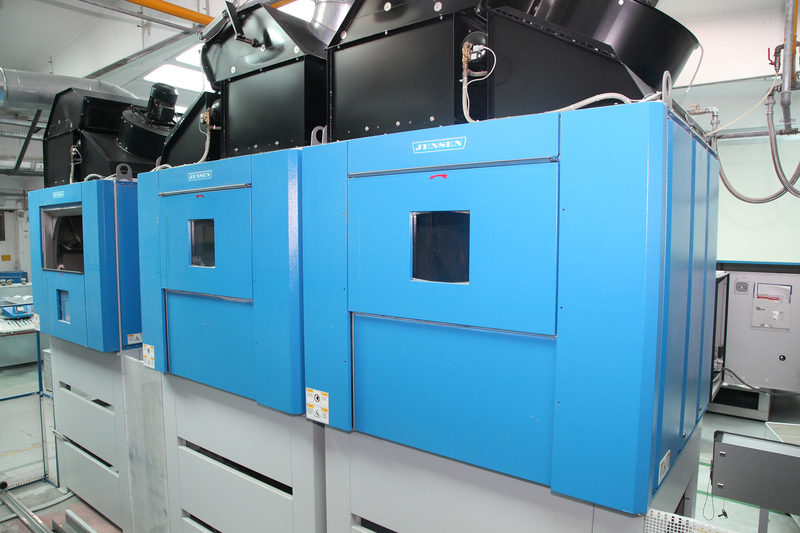 When operating with the Senking high-pressure press, the RecoCross heat exchanger and Infrared Control, a maximum energy reduction of 55% can be achieved in comparison to operation with a conventional steam-operated dryer and a standard press connected upstream. The Jenroll EXPG ironer combines a number of the latest technologies such as a flexible chest using oil as its heating medium with an integrated gas-fired burner and heat exchanger. By using chests made from high-grade carbon steel, the distribution of energy to the linen is at its optimum as heat conduction is 4 times higher than that of stainless steel, for example. Transfer of heat via the oil medium is up to 40% higher than that of steam, as oil can be heated up to 230°C, whereas only 190°C (12 bar) can be achieved with a traditional steam installation. The higher temperature increases drying capacity, especially when running heavy sheets and duvet covers. Due to the higher temperature the output of the Jenroll EXPG ironer can be increased by up to 25% compared to a steam operated ironer with flexible chests. Furthermore the Jenroll EXPG is a space saving solution because the capacity of a 2 roll Jenroll EXPG equals that of a 3 roll steamheated ironer incorporating a fixed chest. The exchange of air is essential for optimum performance of the tunnel finisher. Saturated air must be discharged and replaced by unsaturated air. Accordingly, the Omega Pro Gas features not only individual temperature control but also separately adjustable inlet and exhaust air parameters per drying zone. A separately adjustable gas burner is integrated in the centre for each drying chamber and injects the heat into the circulated air through a specially developed distribution tube that points at a high-temperature baffle for ideal heat distribution. Energy consumption can be reduced by up to 25% with the Omega Pro Gas in comparison to the Omega Plus. This is realised by recirculating air from the drying zones and the outlet zone into the inlet zone. 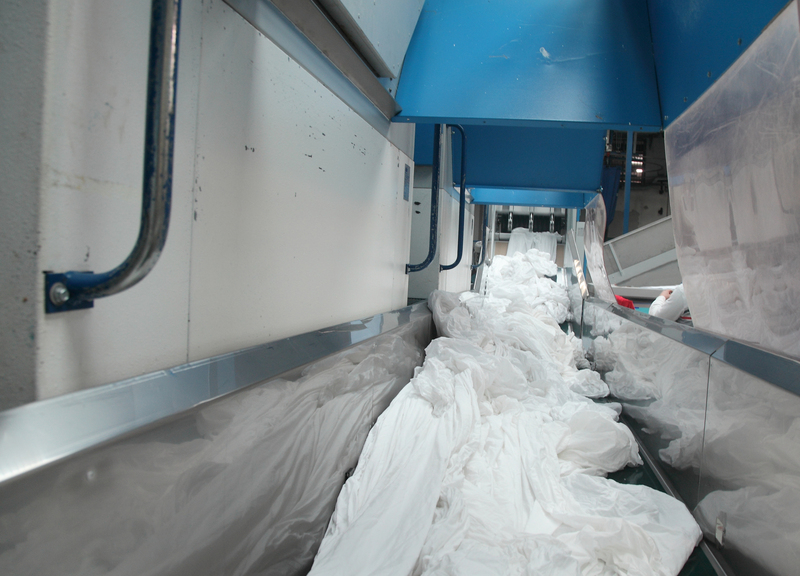 Incoming garments are heated up in the inlet zone using the recirculated hot air. Additionally, the saturated air (exhaust air) is reduced to a minimum and is now discharged at the point where the air has the highest degree of water saturation, i.e. in or after the first drying zone. Instead of two exhaust ventilators to discharge the saturated air, only one was integrated into the Omega Pro; this ventilator discharges the saturated air over the roof. A further ventilator recirculates the hot exhaust air from the drying zones and he outlet back into the inlet zone. Clean Style s.r.l. 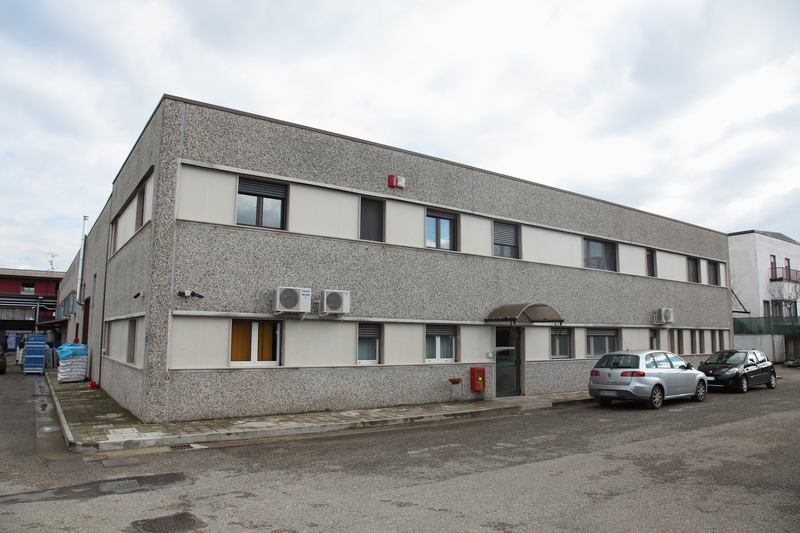 in Apice (BN) occupies a 2300m2 area. 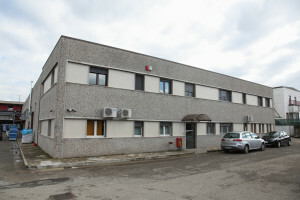 It was set up in 1994 to treat about 3000kg/day of rental laundry from restaurants, hotels and a few clinics. In 1996 the company converted its rental business and began to work solely for third parties. Initially, the processing cycle used only steam, which was produced by a 3000 kg steam/h generator powered by BTZ fuel oil. 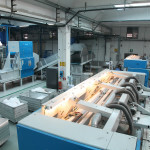 The processing unit comprised a Zanussi continuous batch washer, 8 50kg drums, and 2 ironing lines (mangles with 3 600mm. diameter rollers and 2 800mm. diameter rollers). In 1997 the Zanussi continuous batch washer was replaced by a Senking P36-18 drum continuous batch washer and a third ironing line was introduced. In 2003 the steam generator’s burner was converted from BTZ to methane. 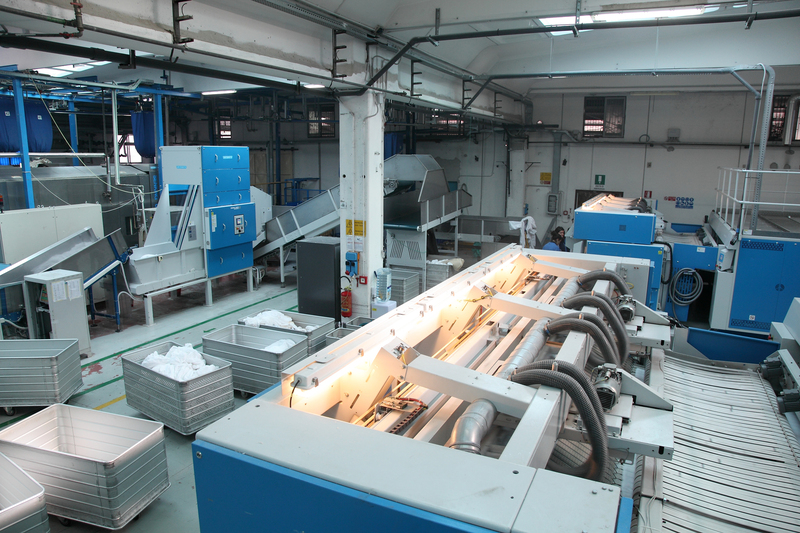 In 2006 the company made its first investment plan to upgrade productivity; , a second continuous batch washer was introduced (Senking P50-18, 18 50kg-drums) and the machinery on the three ironing lines was replaced (2 JENSEN Logic Plus feeders, 2 ILM mangles (with 3 1000 mm. diameter rollers) and 1 ILM mangle (with 2 1200 mm. diameter rollers). It was thus able to process 12000 kg/day. Although its capacity was already noteworthy, in 2010 it needed to invest even further, both to satisfy the growing workload as well as to launch a real energy-saving and environmental protection plan. 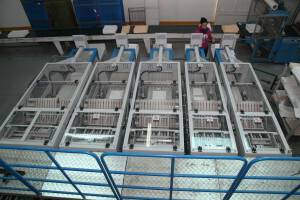 The Senking P36 continuous batch washer was therefore replaced with a 50-kg Senking P50 continuous batch washer connected to a 51 bar HD Senking press. The 6 Senking steam dryers were replaced by the Senking DT 90 gas (methane) dryers and a heat exchanger was also introduced to recover the heat from the discharge water of the continuous batch washers, that could power the latter with water at about 40°C. This also had a positive effect on the treatment unit that operated with water at lower and easier-to-manage temperatures. In 2012, the ILM mangles were replaced with JENSEN Jenroll EXPG gas (methane) mangles (2 1200 mm. diameter rollers). During this phase, the heat plant was significantly downsized since there was no longer any need for a significant amount of steam. In fact, at present, a methane-powered 1500kg steam/h generator sends the steam to the 2 continuous batch washers and to three steam dryers which are used solely to air the laundry that is sent to the ironing lines. In the same year a JENSEN Viking connected to a U module was introduced, directly serving an ironing line and indirectly serving another line. 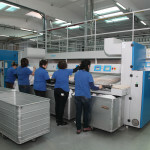 The entire process is of course monitored by software that manages customers from dirty laundry selection to packaging. 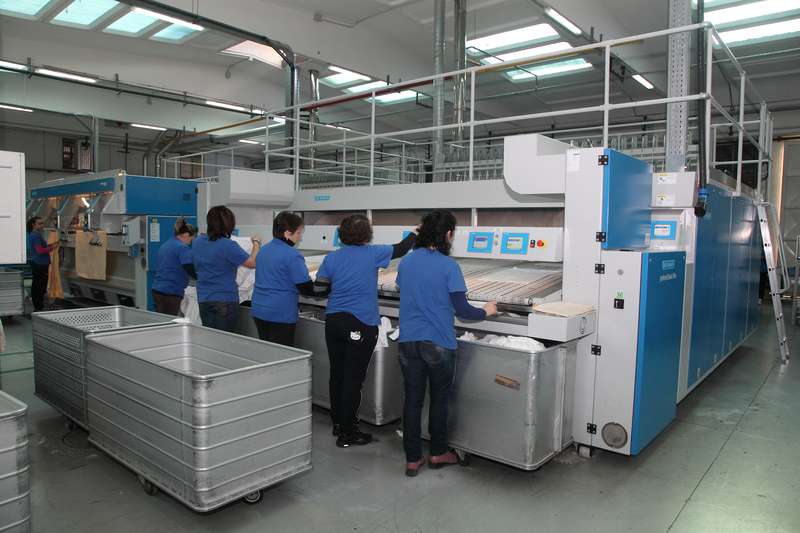 The unit has an average potential of 2200 kg/h, with 28 people working on the entire production cycle. 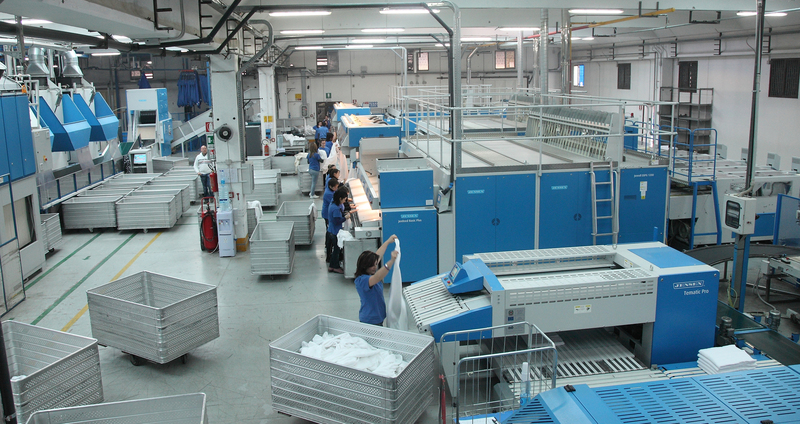 The company is certified to ISO 9001:2008, UNI EN ISO 14001, UNI EN ISO 14065. 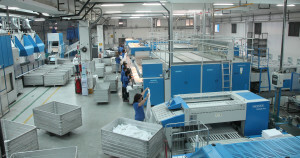 The constant monitoring of consumption (methane, water, electricity) and the goals achieved in terms of the unit’s productivity over the years, have proved that the company’s significant investments were right on target, thanks to the consulting services of leading producers of high-tech machinery for laundries, first among these the JENSEN-GROUP. Converting its equipment from steam to gas (methane) technology, and installing eco-sustainable, energy-saving machinery, meant that the company had access to economic incentives to purchase the machinery. This was both economically rewarding for the company, a kind of prize for its investment, and also earned the company recognition: the prestige of being recognized as a company that helps to pursue an important objective for the community, sustainable development. 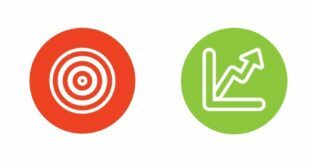 By analyzing the figures, consumption levels over various years can be compared, and the efficiency of the installed systems and therefore the benefits for the company, can be determined. The table here below shows the ratio between consumption (methane, electricity, water) and the laundry treated, from 2009 to 2013. Methane consumption decreased significantly. The reason for this lies in the lower startup consumption levels of methane; during the period when the use of steam “prevailed”, about 200m3 of methane were needed for startup to take pressure throughout the unit. With the move to methane, since every machine has its own burner, it can be started when needed independently of the system startup. For example, just 50m3 of methane are required to start 3 ironing lines and each dryer uses 21 m3/h which are sufficient for three drying cycles (corresponding perfectly to the builder’s technical descriptions). Consumption levels are significantly low of course because of the higher performance machinery, which has on-board burners to avoid excessive load losses. 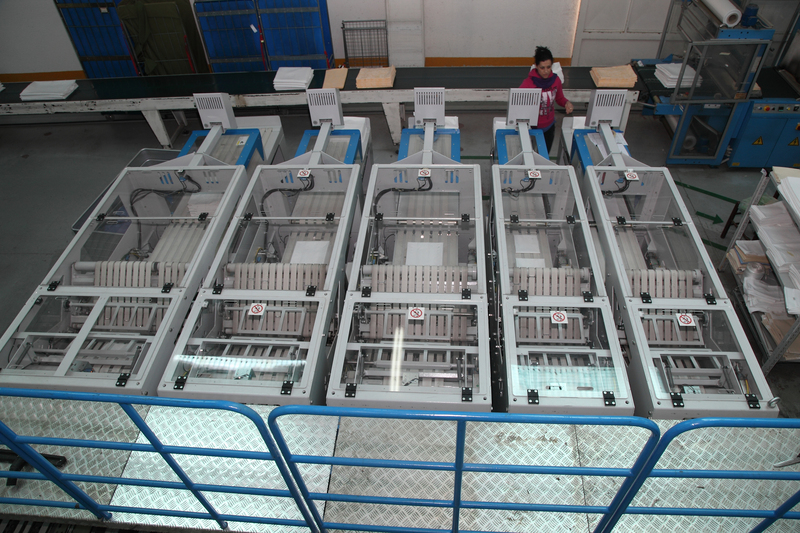 The electricity savings are tangible, the machines can pursue the same objectives in less time. In the same way, water consumption decreased significantly with the introduction of next generation continuous batch washers that offered a higher recovery rate of washing water and a heat exchanger that required 50% less steam to reach the washing temperature. 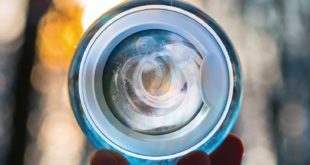 Noteworthy here is the fact that the figures for water consumption include not only laundry washing, but also the water used for the softener and osmosis system. The space savings should not be underestimated either. By choosing methane-powered machinery, the company was able to reduce size of the heat plant which occupied a 150 m2 space and had two 3000kg steam/h boilers, a degasser, condensate return tank and osmosis system. At present, only one 1500 kg steam/h boiler is required occupying a 40m2 space, and offers significant savings on the treatment of boiler water and condensate reintegration (from 0.700 to 0.380 l/kg of laundry). As a result of the energy saving data, economic incentives were requested, in particular Energy Efficiency Titles. Energy Efficiency Titles (EET) are issued by the ESP (Energy Service Provider) to Energy Service Companies (ESCo) who apply for these on behalf of subjects that have implemented energy saving measures. Established under Ministerial Decree No 07/2004, EETs are economic incentives for subjects who choose efficiency to reduce energy consumption, resulting in a lower environmental impact. As a result of the economic incentive mechanism, Energy Efficiency Titles encourage the more rational use of energy in both an industrial and civil context. In order to apply for Energy Efficiency Titles (EETs) the project must be submitted to the ESP by an accredited ESCo. EET recognition is given through the approval of the ESP with ENEA technical support provided during the assessment phase. EETs are mainly given to companies that focus on energy savings by modifying their production facilities. 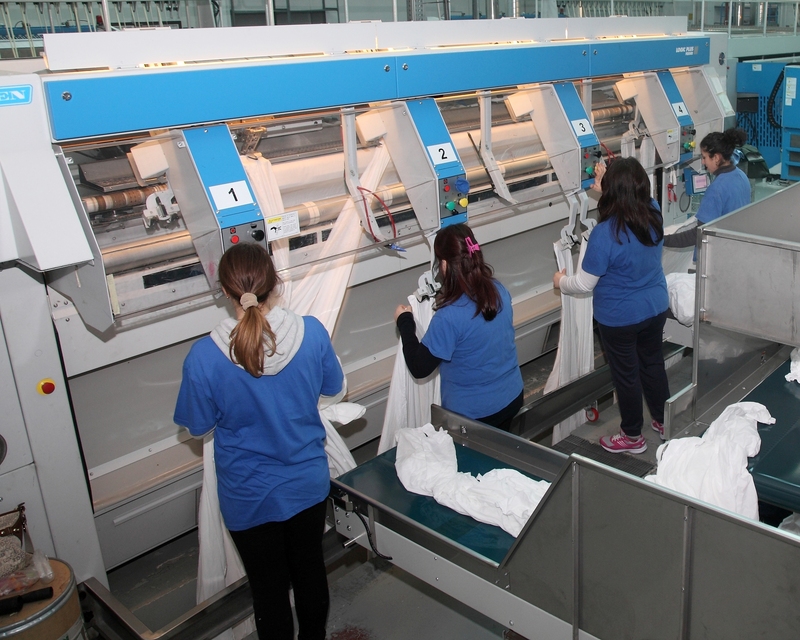 If a laundry with an output of 10000 kg linen/day changes its own facility from steam to methane, the energy savings will allow the company to have 2 – 2.5 EETs a day (these figures refer to the results obtained by Clean Style, whose entire production facility has Jensen machinery). When applying for EETs, Clean Style was assisted by an ESCo supported by IMAT, represented by Piero Bazzoli, whose assistance allowed the company to develop a project that produced excellent results. After analyzing the energy savings, AEEG (Italian Regulatory Authority for Energy and Gas) approved 1190 EETs for 2012, and 1400 EETs for 2013, when production increased by 20% over the previous year.